Below the Rio Grande he had once been known as “The Killer.” Now he flew through hell skies, leader of the strangest squadron that ever dared face death from flaming Spandaus. Outcasts—all of them—branded with the convict’s arrow! No cowards came to the Jailbird drome—only those dishonored war eagles who chose a chance to die in action rather than rot behind prison bars. Hot tempers, liquor, and the madness of war had brought them low—but beneath it all they still were men! 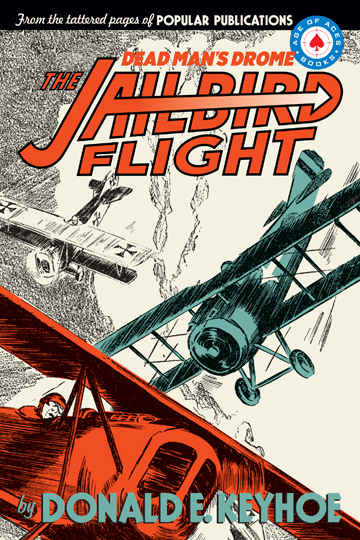 This is the first of two exciting volumes of the collected adventures Donald E. Keyhoe’s Jailbird Flight stories that ran through all three of Popular Publication’s air anthology titles. Starting in Battle Aces in September 1931 running through the end of it’s initial publication run when they switched to Battle Birds at the end of 1932 and into Dare-Devil Aces in 1934. In August of 1931, Donald E. Keyhoe started three long-lived series in three different aviation magazines: Philip Strange in Flying Aces; The Devil Dog Squadron in Sky Birds; and The Jailbird Flight in Battle Aces. This volume features the first seven Jailbird adventures published by Popular Publications in 1931 and ‘32. A former U.S. Marine pilot, Keyhoe was a prolific contributor to the pulp magazines, but he is perhaps best remembered for his UFO research in the Fifties and Sixties.